THE SIKH NUGGET: Weapons of Guru Gobind Singh's 'Shastar Nam Mala'. Weapons of Guru Gobind Singh's 'Shastar Nam Mala'. 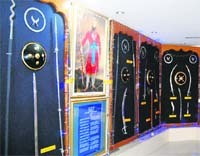 The Chief Khalsa Diwan’s museum boasts of 75 weapons mentioned in the ‘Shastar Naam Mala’ penned by Guru Gobind Singh. Weapons on display at the Chief Khalsa Diwan museum located on the Central Khalsa Orphanage premises in Amritsar. You may have seen museums preserving articles of historic importance for posterity, but in a unique initiative, the Chief Khalsa Diwan here has got the weapons of the times of Guru Gobind Singh made afresh on the basis of their description in “Shastar Naam Mala” compiled in “Dasam Granth” and showcased them in a museum. When The Tribune team stepped into the museum, located on the premises of Central Khalsa Orphanage here on Thursday, it was pleasantly surprised to see shimmering weapons tastefully displayed in glass cabinets with each weapon having its name mentioned in Punjabi and English. At the centre of the museum is a huge portrait of Guru Gobind Singh and below it is a picture frame displaying a few verses of “Shastar Naam Mala”, a composition mentioning the names of weapons used during his lifetime. On either side of the Guru’s photograph are two huge spears --- Wada Sela and Naagni Wadi. While Wada Sela was used to tear apart shields sitting atop an elephant on the battleground, Naagni Wadi is a type of spear with its head in serpentine shape, with which Bhai Bachitter Singh took on a drunken elephant during the second battle of Anandpur. The museum till now has succeeded in procuring 75 weapons mentioned in the “Shastar Naam Mala”. These include shamsheer, marthi, sela barchha, baaghnakha, faadi guraj, saithi, kadara, safajang, bugda, kirch, karauti, khanda, wadkari, kattas, shikarga, badamcha to name a few. On the one hand, you have baaghnakha, a claw-like weapon designed to fit over the knuckles and on the other you have jamdaadh, two-blade dagger which looks like demon tooth. Then there is sarohi (a special sword), bichhua (crooked dagger), asi (curved sword), and different types of arrows. The museum also boasts of microfilms of 67 hukamnamas (edicts) of various Sikh gurus, which include 24 of Guru Gobind Singh, 28 of Guru Teg Bahadur, six of Guru Hargobind and eight of Mata Sundari. Surprisingly, not many people are aware about the museum which came up about a couple of years back. Orphanage official Daljeet Singh Bedi and Superintendent BS Saini said the museum was a treasure trove of knowledge for the new generation. Though the Diwan authorities say it is open to all, no effort seems to have been made to draw the visitors. Not even a board has been put up outside the orphanage’s main entrance highlighting the museum. Dwelling on the genesis of the idea, the Chief Khalsa Diwan’s honorary secretary and orphanage in charge Bhaag Singh Ankhi said he would often read the names of weapons, while reciting gurbaani and would wonder how they would have been. “One day I decided to raise a museum in which we can put on display all such weapons so that the next generation not only reads about them but can also see them. First I zeroed in on an expert who could guide me in this job. Then I travelled to Maharasthra, Agra , Patiala and Damdama Sahib in search of these weapons. Sikligars of Maharashtra were a great help in reproducing these weapons while the Nihangs also chipped in with their effort,” he averred. On publicising the museum, he said they would take the necessary measures in this regard very soon so that the people, including non-Sikhs, can be sensitised on Sikh history. The “Shastar Naam Mala” is made of 1,318 verses spread over five chapters in 98 pages in the “Dasam Granth”. The opening chapter of 27 verses is an invocation to Bhagauti (sword) for assistance and contains the names of 30 weapons. Here the sword is personified as God. In the list that follows, the weapons of the day are presented under fanciful names, such as “Baaghnakha”, “Toofani Gola”, “Naagani Wadi” and “Aradh Chandar Teer”. Many of the weapons are listed in the form of riddles. 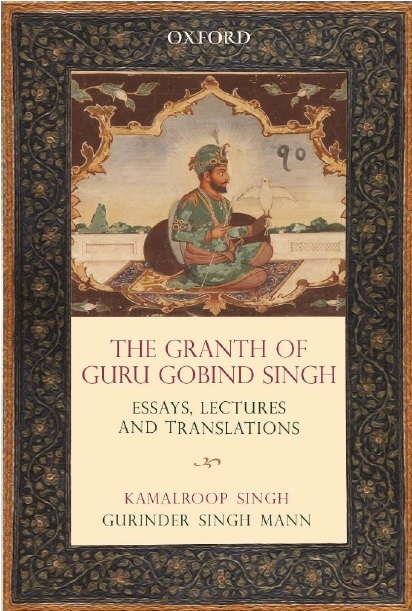 The second chapter, having 47 verses, revolves around “chakra” (spears and quoit) though it also mentions about sword, “jamdadh” and “sehthi”. There are 178 verses which dwell on different names of arrow, while another 858 verses name modern weapons like the gun.